Home baby children Eleven Months. .You haven't grown a whole lot when it comes to diapers.. still wearing a size 3. .You are wearing size 9 month onesies, size 9 month and size 12 month pants and size 12 month sleepers. This month I pulled out a bunch of your winter outfits from size 12 months to take back to the midwest with us.. most fit perfectly, but I haven't broken out your entire 12 month wardrobe yet. .You are long and skinny. Like your Dad. .You were a champion for a two week vacation back to Kansas and Missouri. You traveled in the car really well, but Mom did ride in the back with you. .You had your first Thanksgiving and celebrated your first Christmas during this month. You were a busy little bee to say the least. .You traveled a lot this month.. you also visited Alabama when Daddy graduated from WOCS. He could not believe how much you had changed since he last saw you. Little miss independent is an understatement. .You mastered true crawling this month.. on your knees and hands. You've basically been even more unstoppable since that happened. .You love to unload things, like bookshelves or baskets full of toys. .You love to be chased around. You turn around, see someone following you and screech before taking off again. .You love dogs. All dogs. You giggle so hard when they give you kisses.. but you especially love Piston. He is so good with you and has basically grown accustomed to you constantly being right there with him. .You started eating everything Mom and Dad eat. Nobody gets away with eating anything without you eating it too..
.You love to unload the diaper bag. If Mom forgets toys, she just lets you go to town on taking every last thing out of the diaper bag. You are starting to get kind of quick at it now. .You love selfies. If someone takes a picture with you on their phone.. all they have to do is turn it so you can see yourself, and you will ham away. .You have 5 teeth. Your two on the top, two on the bottom and the one random one that popped through at two months old. .You still need mama to nurse. You nurse in the morning to start your day, before your naps, and at night before going to bed. .You have a jacked up sleep schedule right now. All this vacation action will do that to a girl. .You still smile, all the time. You are oh so very happy and it is rare for you to be cranky (think NEED to sleep, or NEED that food). Grace Elaine, each day with you is an adventure. You turn one soon, and while I can not believe it is already that time... I am so thankful for each moment with you. Your sweet personality makes my heart swell with pride everyday. I am excited to watch you grow and learn more.. thanks for being the sweetest baby ever. She is adorable and looks like a super happy baby! She is gorgeous and turning one is such a momentous occasion! We had the best time at my niece's first birthday. She is such a ham! So cute! Traveling for holidays screwed Evelyn's sleep up too. Beautiful! My (almost) 18 month old loves selfies too. Haha. I can't believe she's almost 1 already!! wait just a hot minute! 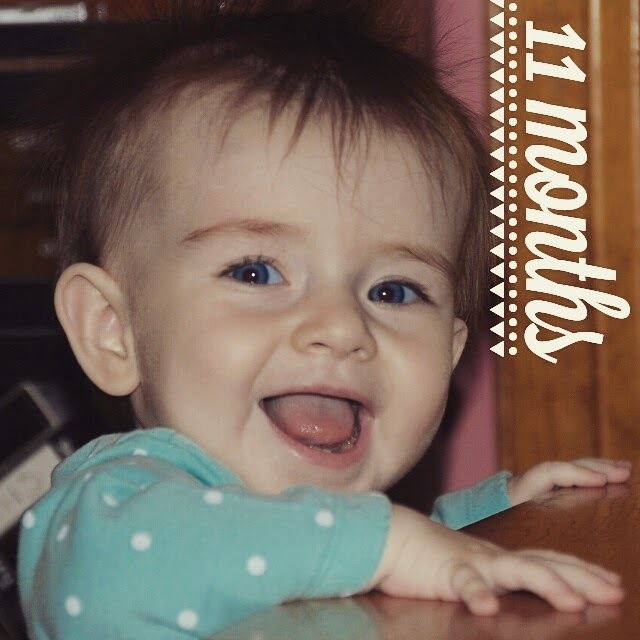 11 months!?!?!?! WHEN!? These children need to slow it down. I genuinely don't believe you that she's almost a year old. Nope. Can't be. She is seriously the sweetest thing!